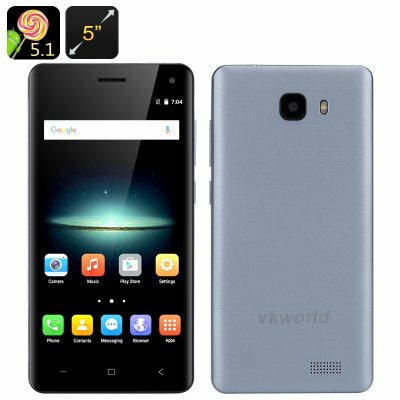 Successfully Added VKWorld T5 Smartphone - 5 Inch HD Screen, Android 5.1, Bluetooth 4.0, Gesture Sensing, Smart Wake, MTK6580A Quad Core CPU (Blue) to your Shopping Cart. Stay connected in style with the VKWorld T5 Android Smartphone, coming with a 5 inch HD screen, quad core processor, Smart Wake, Gesture Sensing and more. VKWorld, a famous smartphone manufacturer in China, is happy to present another great and inexpensive model — the VKWorld T5 smartphone. The phone comes with all you need from an entry level model, plus sports a few cool extras to play around making it a great cell phone for Smartphone newcomers or anyone seeking value for money. First, you have a nice 5 inch HD screen where you can enjoy watching all your media: movies, videos, pictures, browsing the web and more. This is becoming the new standard for cell phones and is a real treat with a great color pallet and brightness. Android 5.1 is one of the most popular interface to have and with this at your service you will easily navigate the device with all the apps clearly displayed and even more waiting for you at the Play Store. The smartphone covers networks: 2G: GSM 850/900/1800/1900MHz and 3G: WCDMA 900/2100MHz, and supports two SIM cards that can be active at the same time. The quad core processor will back up quick operation and multitasking while the Mali-400MP GPU makes for great graphics brining everything to life. Among the two fun features are Smart Wake and Gesture Sensing. Smart Wake lets you “draw” on the smartphone’s locked screen to get quick access to selected apps, while Gesture Sensing makes sure the VKworld T5 “listens” to every move of your hand allowing you to flick tough music tracks and navigate apps with a simple wave of the hand. The VKWorld T5 Smartphone comes with a 12 months warranty, brought to you by the leader in electronic devices as well as wholesale Android Phones..